About 1320 Dante made his final home in Ravenna, where he died on the night of September 13-14, 1321. His body was brought to the church of San Francisco. 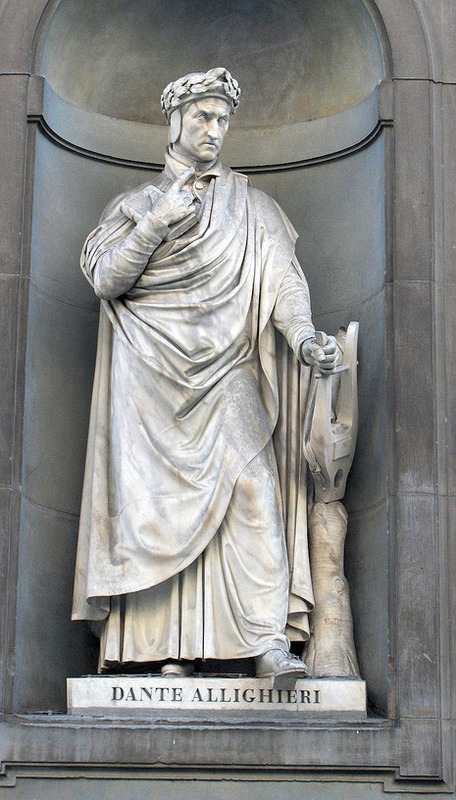 Shortly after he died, Dante was accused of Averroism and his book, De Monarchia, was burned by the order of Pope John XXII. Franciscan monks hid Dante's remains, when Pope Leo X decided in 1519 to deliver them in Florence to Michelangelo, who planned to construct a glorious tomb. Again in 1677 Dante's remains were moved, and in 1865 construction workers rediscovered them accidentally. 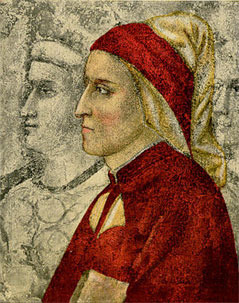 In 1315, Florence was forced by Uguccione della Faggiuola (the military officer controlling the town) to grant an amnesty to people in exile, including Dante. But Florence required that as well as paying a sum of money, these exiles would do public penance. Dante refused, preferring to remain in exile. When Uguccione defeated Florence, Dante's death sentence was commuted to house arrest, on condition that he go to Florence to swear that he would never enter the town again. Dante refused to go. His death sentence was confirmed and extended to his sons. 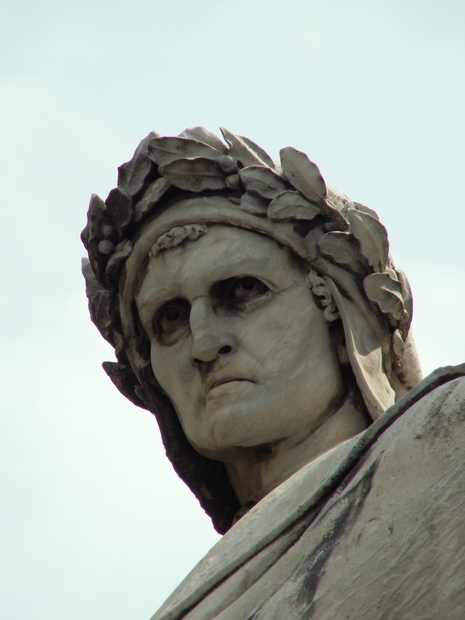 Dante still hoped late in life that he might be invited back to Florence on honorable terms. For Dante, exile was nearly a form of death, stripping him of much of his identity and his heritage. Prince Guido Novello da Polenta invited him to Ravenna in 1318, and he accepted. He finished the Paradiso, and died in 1321 (at the age of 56) while returning to Ravenna from a diplomatic mission to Venice, possibly of malaria contracted there. 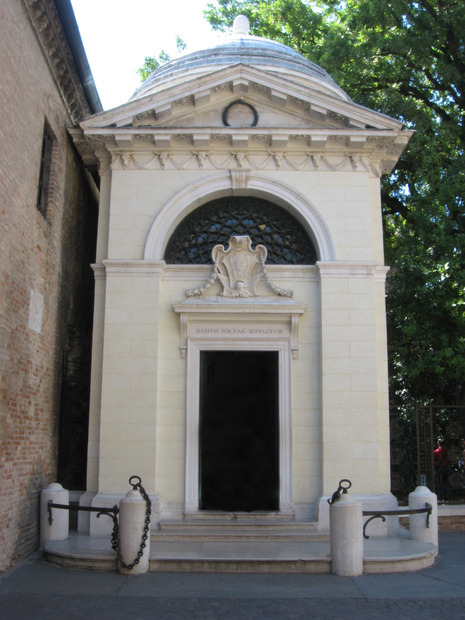 Dante was buried in Ravenna at the Church of San Pier Maggiore (later called San Francesco). Bernardo Bembo, praetor of Venice in 1483, took care of his remains by building a better tomb. Dante's epic masterpiece, The Divine Comedy, was probably begun around 1307; and he completed the work shortly before his death. It is divided into three sections, correspondingly named the Inferno (Hell), the Purgatorio (Purgatory), and the Paradiso (Paradise). Eventually he stayed with the Della Scala family of Verona, after which he moved to the Court of Guido Novello da Polenta at Ravenna. He became ill and died in 1321 on his return from a diplomatic mission to Venice.